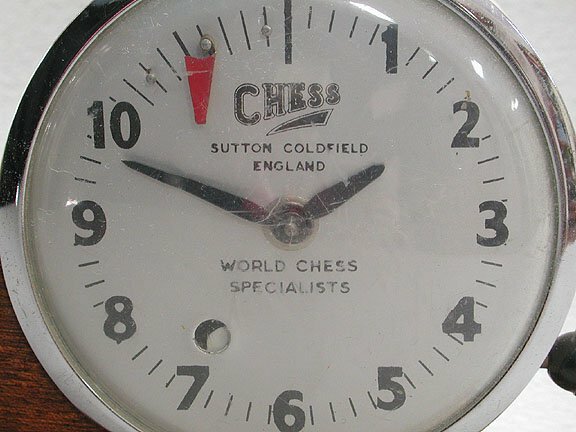 Sutton Coldfield Antique Chess Clock. 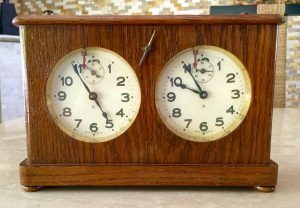 This offering features a Sutton Coldfield Antique Chess Clock with two metal cased timing mechanisms mounted on a Mahogany pedestal. There were sold through the Baruch Wood’s magazine Chess as well as the British Chess Federation. 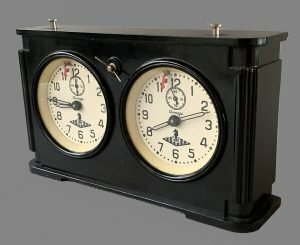 This mechanical analog clock features wind-up mechanisms which can be independently stopped by pushing a horizontal sliding bar which employs metal strips to engage one of the escapements, thus causing that timing mechanism to stop. The case measures approximately 8-3/4″ x 4-5/8″ x 2-1/4″. The case has a baize covered base and is in very good condition. Both the movements are in good working order. 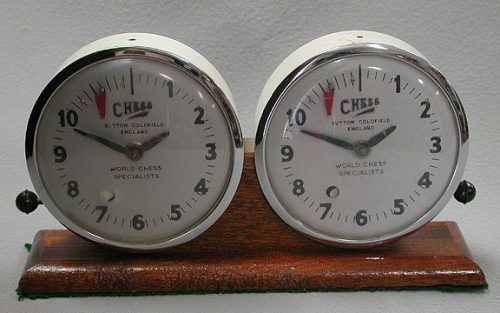 Sutton Coldfield chess clocks date from around 1938, These Timers were used in many clubs and could be found in use at tournaments of all levels throughout the United Kingdom in the early to mid 1900s.